The Owens Fire is estimated to be 312 acres and 80% contained. It is located along the Owens River Road, which is east of Hwy. 395 in the June Lake area. Last night crews made excellent progress getting initial containment with dozers and crews. Today, they will continue to improve this line and begin mop operations along the edge. The Owens River Road is closed between Big Springs Campground and Cashbaugh Ranch. There is an evacuation advisoryfor Big Springs Campground, Inaja Ranch, and the Arcularius Ranch. The Hot Creek Fire is burning near Hot Creek, east of the Mammoth Lakes Airport. It is estimated to be 436 acres at 80% contained. Crews were also able to get initial containment line around the fire, which they will improve today and begin mop-up. The Antelope Springs Road (3S05) is closed between Cashbaugh Ranch and Antelope Springs. Please avoid the fire areas so the firefighters can safely respond to the fire. Both fires are highly visible from Hwy. 395. Weather remains hot and dry with the potential for thunderstorms in the afternoon. 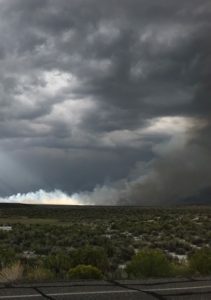 Response is from numerous local agencies including Bureau of Land Management, Cal Fire, Mono County Sheriff, and numerous local fire agencies. The Lions Fire is estimated to be 5,456 acres and 72% contained, showing 361 acres of growth yesterday. Fire activity remains on the western flank, where the fire moved into heavier fuels and has spread upslope along the Cargyle Creek Drainage on the Sierra National Forest. Similar fire activity is expected today. Crews initiated burning operations along the northeast flank of the fire (south of Fern Lake) to create a blackline to remove fuels in front of the main fire. Along the western flank, crews are looking to use trail networks and rock barriers for new containment lines. Helicopters are supporting them by cooling the fire’s edge with water drops. Fire behavior is moderate to high intensity where uphill, wind-driven growth is occurring. The area has seen approximately 50% tree mortality from bark beetles. The Lions Fire currently has 111 total personnel assigned, including four crews and four helicopters. Resources continue to arrive. Warm and dry conditions remain in the forecast with the potential for continued thunderstorms for the next several days. Smoke: Smoke from the Lions Fire is visible along the Reds Meadow Road (Minaret Vista, Devils Postpile National Monument), Mammoth Mountain, and the Town of Mammoth Lakes. Significant fire activity from numerous fires throughout the state is affecting air quality in the Eastern Sierra. More than 100 people attended a community meeting yesterday at the Mammoth Lakes Welcome Center. There was an update on the fire situation and air quality issues. An informal question and answer session brought the meeting to a close. Based on air pollution levels at the Mammoth Lakes PM10 monitor between 5:00 AM and 8:00 AM PDT a Stage 1 Air Pollution Health Advisory has been issued for Mono County. Other Mono County communities may be impacted during different parts of the day. Visit www.gbuapcd.org for current information. A Stage 1 Health Advisory recommends children, the elderly, people with heart or lung problems, or people with current illnesses such as the flu, to stay indoors and avoid strenuous outdoor activities in the impacted areas. Air pollution monitors in Mono County: Bridgeport, Lee Vining, June Lake, and Mammoth Lakes. Additionally the US Forest Service has a PM2.5 Monitor deployed in Mammoth Lakes. Smoke conditions may change quickly. If you have any questions please visit: www.gbuapcd.org or call the Great Basin Air Pollution Control District office in Bishop at 760-872-8211 during regular business hours.